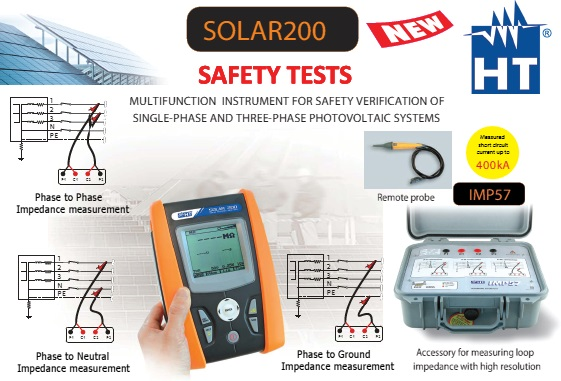 SOLAR200 is an innovative instrument designed for carrying out electrical safety verifications on photovoltaic systems in compliance with the relevant safety requirements. The instrument is very easy to use and has a wide range of functions which can be selected by means of the simple multi-language menu. Measurements can be started both by pressing the button located on the instrument body and by pressing the button located on the remote probe (optional accessory PR400) which makes carrying out more measurements in sequence very simple. The help on line, which can be selected by the user and is active for any function, is a valid support for the connection of the instrument to the system to be tested. SOLAR200 is provided with an internal memory and an optical/USB interface for PC connection and for transferring measured data, which can be analysed with the dedicated software.